Welcome back to Press Start to BGN, Laurier’s gaming show by a bunch of Game Design & Development students here at Laurier’s Brantford campus. The program is very new and so is our show, so for those who don’t know Game Design & Development is headed by Dr Scott Nicholson through the Brantford Games Network or BGN, hence the name “Press Start to BGN” which sounds like “begin.” This week on the show we talked about the games that were revealed during Paris Games Week and our impressions on Mario Odyssey and Assassin’s Creed:Origins. Thanks for tuning in! The Paris Games Conference happened this week and with it new trailer’s and new announcments. Sucker Punch Productions has announced a new game, Ghost of Tsushima, after three years of silence. The Last of Us Part 2 has a new trailer featuring completely different character’s than what we have seen before and features people who appear to be in some sort of violent cult. Spiderman also got a new trailer featuring what appears to be kingpin. God of War has a new trailer. Star Wars Battlefront 2 has a new trailer with a perspective flip to the side of the empire. Call of Duty WW2 was also features at the conference. Sony has revealed Detroit: Become Human’s release window. The narrative-driven game will launch sometime during spring of 2018. Monster Hunter World gets its first announced DLC for PS4, and you’ll get to try the game soon. Guacamelee 2 has been announced. See, it’s my name on this week-long festival, but i don’t have a good pun/joke… ah well lets get on with it. My job is pretty easy today, not much has come out this week. Did you know Steven Universe had a mobile game? Well the sequel to it is out, and I’m bloody excited for it! 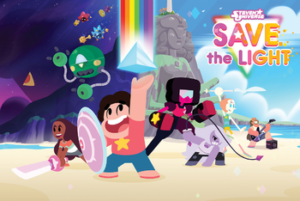 Save the Light is a game where you play as characters from the hit Cartoon Network show Steven Universe, in an original story co-written by the creator of the show her self, Rebecca Sugar. With a blend of real-time and turn-based combat, and a whole lot of more in-depth gameplay than it’s predecessor, the game looks like fun for those fans of Steven and his family! That’s it for this week! Hope you guys had a spoopy halloween! From Nintendo comes the adorable life simulation game Animal Crossing: New Leaf! In this game, you are the mayor of a town filled with andromorphic animals. Talk to your town residents, explore your little town, and enjoy various activities such as bug hunting and fishing. Modify your wardrobe and get yourself a lovely house in this charming game available on the Nintendo 3DS. From Thunder Lotus comes the action adventure game Jotun. Play as Thora, a recently deceased Viking woman on her quest to seek favour with the gods from Norse mythology by defeating various Jotun, elemental creatures of elemental power and strength. Each frame of gameplay is hand drawn to give the game the feeling that the player is playing an animated film. Fight for your chance to enter Valhalla’s gates, available on PC, Wii U, PlayStation 4 and Xbox One. From StudioMDHR comes the 1930s cartoon inspired run and gun game Cuphead. To repay a deal he made with the devil, Cuphead and his brother Mugman must fight a series of bosses to collect their souls for the devil. Play in both single and cooperative mode in this hand drawn, Max Fleisher animation inspired game, available on PC and Xbox One. From Nintendo comes the newest installment to the Mario franchise, Super Mario Odyssey. Play as Mario with his new companion Cappy, a spirit that has possessed Mario’s hat, as the two of them travel across various worlds to stop Bowser from marrying an unwilling Princess Peach. Unlike previous Mario installments, the game is more explorative with an open-ended gameplay structure such as that of Super Mario Sunshine and allows Mario to capture and control various enemies, NPCs, and objects with the help of Cappy. Explore and progress through the story your way in this new Mario title, available on the Nintendo Switch. From Guerrilla Games comes their 2017 action roleplaying game Horizon Zero Dawn. In this game, players play as Aloy, an archer hunter who lives in a world overrun by robots. The game comes with an open world to explore, tribes to visit and side quests to complete alongside its main storyline. Discover the dangers and secrets lurking in this games world, now available on PlayStation.